I first tried one of Milli Taylor‘s brownies around this time last year. We’d been chatting online about various food-related things and realised that we live pretty close to one another. Milli had some goodies going spare from a catering job so promised to drop a few samples round the flat while we were out. Several bemused messages later, it dawned on us that she’d left them in the wrong street and I ended up having to tiptoe my way down a stranger’s garden path to retrieve the box from behind the bush by their front door. Not the easiest brownies to get hold of, but some of the best I’ve ever eaten, so when I received a copy of Milli’s debut cookbook, I knew this recipe was the one I’d have to make first. Milli’s brownies come dressed up to party – as befits a book called Party Perfect Bites – with a swirl of salted caramel and a sprinkling of cocoa nibs. 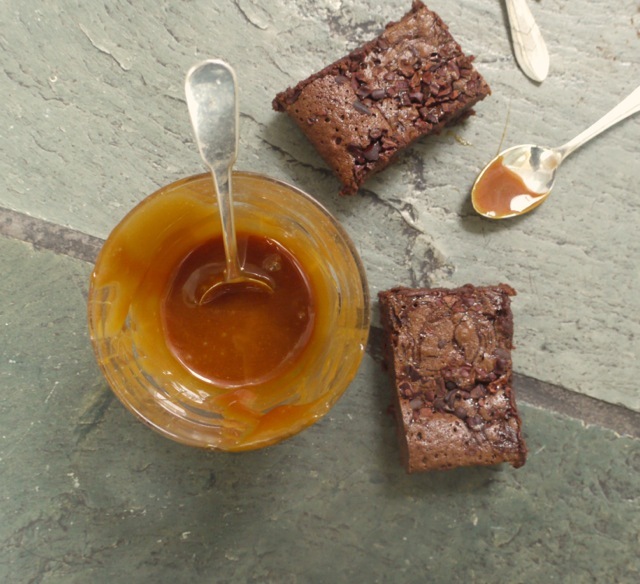 The slight bitterness of the crunchy nibs offsets the smooth, sweet caramel puddled through the fudgy brownie batter. You can use all the caramel in your brownies or, as Milli suggested over email when she knew I was making this recipe, keep about a third back. That way, whether you serve them in cubes as sweet canapés or for dessert with a scoop of ice cream, you’ve got extra warm caramel for dipping and drizzling. A few words on Party Perfect Bites. Posting this recipe for brownies does a slight disservice to the book in that it’s so much more than dessert. The majority of the recipes are savoury, exploring different parts of the world from paella arancini with aioli to mini okonomikyaki and miso-glazed aubergine skewers. The crispy coconut calamari looks out of this world as do dozens of other recipes, not least because they’re photographed by the incredibly talented Helen Cathcart (who also photographed my book!). I’ve wondered several times in the last week if, perhaps, I could survive for the rest of my life eating canapés alone. With a book like this, I probably could. Huge congratulations Milli, you really are the party catering queen! On another note, you may have noticed a different background to my usual wooden table. As mentioned in my previous post, we’re firmly ensconced at my parents’ house while our kitchen is being renovated. My Mum said she’d always thought the slate tiles in her kitchen would make a lovely background for my photos, and I think she might just be right. I’m not sure she was quite so keen on me spooning caramel all over the floor, but needs must. And I cleaned it carefully both before and afterwards in case the word ‘floor’ had you worried – no food goes to waste for the sake of a photo in this household. A squidgy, fudgy brownie with a salty caramel swirl and crunchy cocoa nibs. Start by making the caramel. Put the sugar and syrup in a small saucepan over a medium heat. Swirl the pan but do not stir. When the mixture is a copper colour, take off the heat and slowly whisk in the cream. Add the butter and salt, whisk to combine, then set aside. Preheat the oven to 170 C/Gas mark 3. Grease and line a 23 x 23cm brownie pan with baking parchment. To make the brownies, melt the butter and chocolate in a heatproof bowl set over a pan of barely simmering water Transfer to a large bowl and allow to cool for a couple of minutes. Add the eggs, along with the sugars, salt and vanilla. Fold in the flour. Pour into the prepared pan and smooth the top. Drizzle half to two thirds of the caramel over the top and use a skewer to swirl it around. Sprinkle with cocoa nibs. Bake for 20 - 25 minutes until set on top but slightly wobby in the middle still. Leave to cool completely in the tin then cut into squares. Taken from Party Perfect Bites by Milli Taylor with permission from the author. How much salt for the caramel? Perfect for a party indeed!! These look delicious. Love the combination! I adore adding cocoa nibs to as much dishes as possible, very addictive. Must give these a go. 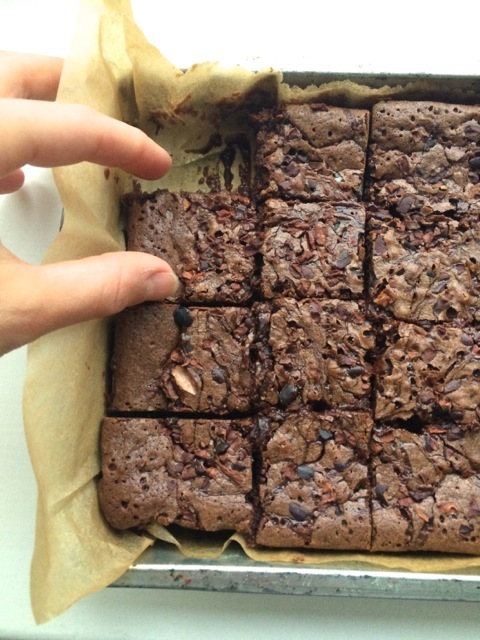 Cocoa nibs in brownies sounds like a great idea because they can be super sweet. This is definitely a must make recipe, sounds like a lovely cookbook too. Will have to keep an eye out for it. It’s such a gorgeous book and although the recipes all look incredible, they’re not actually that complicated – exactly what you want for a drinks party! 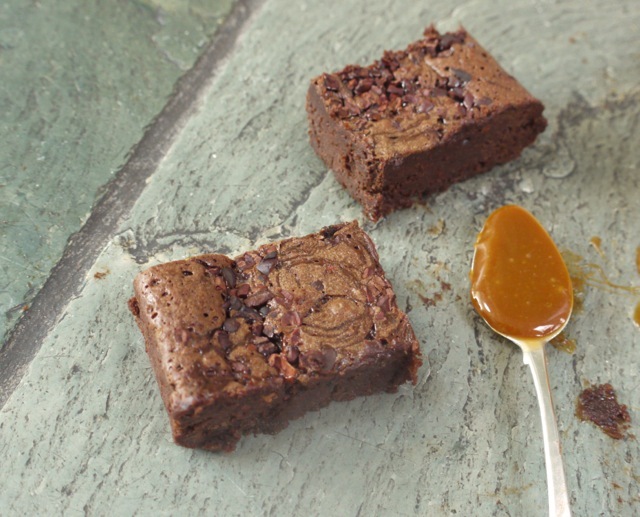 Those brownies look and sound fantastic – I bet the caramel puddles and the cacao nib give them really nice texture! Good luck with all the reno projects and hopefully you’ll soon be home in your own place again! Thanks Sophia, so excited to have a new kitchen! These look delicious and I love the idea of serving weeny squares of them at a dinner party. 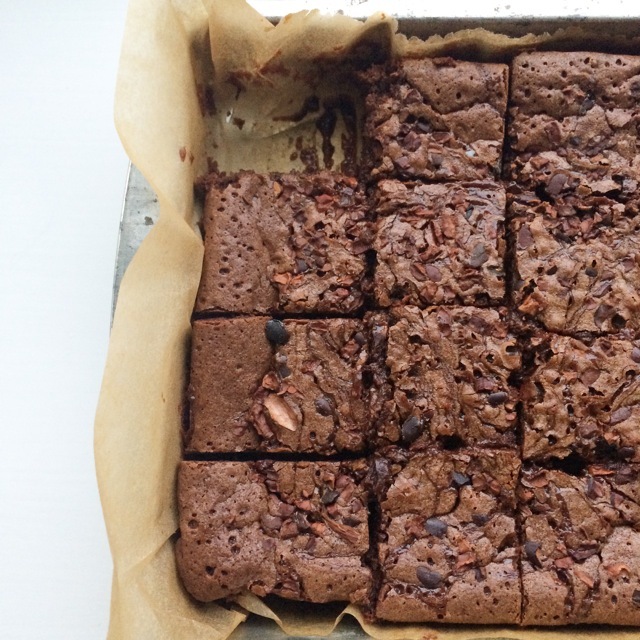 Everyone loves brownies and these little morsels would go down a treat. The trouble would be stopping at one . . . or maybe five! I know you’ve talked about Milli’s brownies before in glowing terms so I’m really excited to try this recipe. Salted caramel and cocoa nibs in there? Yum! 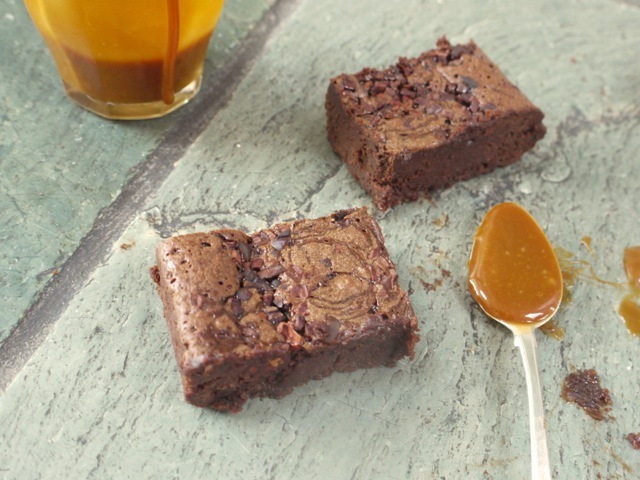 Fabulous, I love salted caramel with chocolate, I must make these brownies, they look divine! I trust you more than most with brownies; I know you like them fudgy, dark, and decadent. So an endorsement from you makes these lovely brownies look even better—which is hard to do given that there’s salty caramel and crunchy, butter cocoa nibs involved :). These look scrummy. I’m having trouble getting hold of cocoa nibs. Waitrose used to sell them but I can’t find them now. Any suggestions ?